ARM is a network dedicated to facilitating the deployment of qualified Australian field epidemiologists and other public health specialists in the event of global, regional, and cross-jurisdictional infectious disease emergencies. The ARM network mobilises experienced public health professionals with skills in field epidemiology, applied public health and outbreak response to provide coordinated and high quality surge response capacity in the event of global, regional or cross-jurisdictional infectious diseases emergencies. 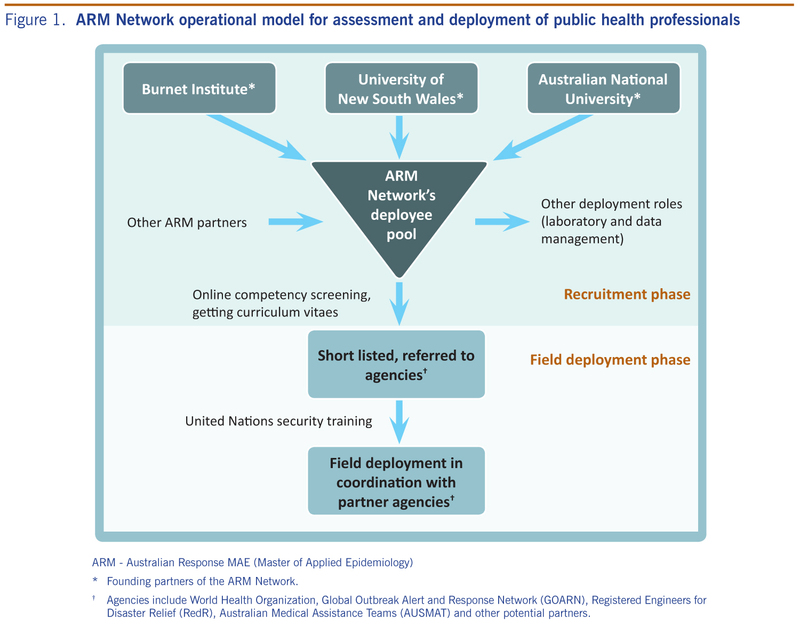 ARM provides a focal point for identification, selection and referral of suitably skilled Australians to be deployed through WHO's GOARN, RedR, and other agencies. ARM is supported by ANU, The Burnet Institute and UNSW. The current model is that ARM partners tap into their own professional networks of public health students and graduates of FETPs or other relevant programs to provide surge capacity when required. However, any organisation or individual with relevant expertise can apply to join ARM. Members of ARM are linked through a private network, where deployment opportunities are posted. Members of ARM are linked through a private network, where deployment opportunities are posted. We review CVs, select suitable candidates and refer them through established deployment mechanisms such as GOARN and RedR. Deployees must comply with the requirements of these organisations. In addition, ARM will use on-line screening modules to ensure minimum field epidemiology capability, and to further improve the quality of Australian professionals deployed to regional infectious disease responses. ARM Network was formed by a group of alumni of the ANU Master of Applied Epidemiology (MAE) Program, Australia's only Field Epidemiology Training Program (FETP), in response to a gap in Australia's national and international response capacity for infectious diseases emergencies. The ARM network showed that good will and the in-kind support of three institutions, linked by the common thread of FETP training, and recognizing the importance of field epidemiology can contribute to national and international response capacity. This is potentially an important way in which Australia can be a regional leader in infectious diseases control. The Australian MAE Program is based on the successful model of the US Centers for Disease Control and Prevention's Epidemic Intelligence Service (EIS) program. The training provided by the MAE is unique and equips graduates to respond to public health emergencies in the field. The Burnet Institute is a Melbourne-based Australian, not-for-profit organisation that links medical research with public health action. We have offices in Myanmar (Burma), Papua New Guinea, China and Lao PDR, and are also involved in research and other project activities elsewhere in Asia and the Pacific. Burnet's Centre for International Health provides technical advice and support, capacity-building, applied research, policy development, and training and education programs. Our areas of expertise include HIV prevention and care, women’s and children’s health, sexual and reproductive health, drug use, primary health care, strengthening national health systems. Dr Tony Stewart is a medical epidemiologist and public health specialist with Burnet's Centre for International Health. He works on a variety of infectious disease issues within Burnet's Centre for International Health, with a focus on vector borne diseases, vaccine preventable diseases, applied epidemiology, program evaluation, survey tools and techniques, and on preparing for and responding to disease outbreaks. Tony chairs WHO's Global Outbreak Alert and Response Network (GOARN) Steering Committee. GOARN is a technical collaboration of institutions and networks which provide an international surge capacity for outbreaks and other public health events. He has a medical degree from Monash University, a Masters of Applied Epidemiology (MAppEpid) from the Australian National University (ANU) and is a Fellow of the Australian Faculty of Public Health Medicine. The UNSW School of Public Health and Community Medicine has one of the largest Master of Public Health programs in Australia, and within that a MPH Specialisation in Infectious Diseases Epidemiology and Control. We also have an internship program with MPH students placed in international and national health organisations, including WHO, to gain field experience. We also have a field-based professional doctorate in public health which operates under a similar model to the EIS, but is more broadly based and trains senior health professionals. We also run summer courses in Disaster Management and a WHO co-run course on Managing Communicable Diseases in Humanitarian Emergencies. SPHCM is a member of WHO GOARN, and can tap into its large staff, student and alumni body to assist with surge capacity in times of need. Raina is a graduate of the MAE (cohort of 1991-92), has extensive field outbreak investigation experience and is an advocate for field-based epidemiology and public health education and training that is relevant and applicable to the field. She is the primary link person for GOARN at SPHCM. The National Centre for Epidemiology and Population Health at the ANU has run the MAE program since 1991. Each year, the program takes 6-10 MAE scholars that are placed in State, Territory and federal health departments and government departments, along with national research agencies. There are over 160 alumni of the MAE program, many of whom are active field epidemiologists and researchers in infectious diseases that have participated in almost 300 outbreak investigations and either established or evaluated various surveillance systems. NCEPH has many staff conducting practical research and capacity building for responding to infectious diseases and outbreaks with health departments in Australia and internationally. In addition, the Centre has extensive collaborative links with international response agencies, such as Médecins Sans Frontières, WHO, CDC and ECDC. Associate Professor Martyn Kirk is the Head of the Field Epidemiology Training Program Australia, the Master of Philosophy in Applied Epidemiology (MAE) degree offered by the Australian National University. He has worked for the last twenty years in State and Territory, and federal health departments in the areas of food, water and infectious diseases. In 2000, Martyn was appointed as the Coordinating Epidemiologist of OzFoodNet to establish a national network for the investigation of foodborne diseases. He has consulted for the World Health Organization on gastrointestinal diseases and is a member of the WHO Foodborne Disease Epidemiology Reference Group. Martyn is a member of the Communicable Diseases Network Australia and an adjunct lecturer at the Monash University Department of Epidemiology and Preventive Medicine. His research interests focus on the epidemiology of diseases that may be transmitted by contaminated food or water, and in particular improvements to the surveillance of infectious diseases and the response of government agencies to outbreaks of infectious diseases. Whilst Australia has response capacity for trauma and emergencies, there is no nationally funded mechanism for identifying, selecting, and deploying qualified professionals to respond to outbreaks and infectious diseases emergencies which cross national and international borders. Such responses require experienced public health professionals with skills in field epidemiology, applied public health, and emergency response, of which Australia has many. Australia is well placed to provide such capacity, and there are many skilled professionals who are willing to contribute to the control of infectious diseases regionally. The gap in national and regional response capacity was discussed at a national workshop held at UNSW in May 2012, where the guest speaker was the current director of the US CDC's EIS program, Dr Douglas Hamilton. The momentum was set at this meeting and discussions continued into 2013. Three alumni of the MAE program, Dr Tony Stewart, A/Prof Martyn Kirk and Prof Raina MacIntyre, established the ARM network in response to Typhoon Haiyan in November 2013. Through the ARM network, several highly skilled professionals were deployed through the World Health Organization's Global Outbreak and Response Network (GOARN). We demonstrated that good will and the in-kind support of three institutions, linked by the common thread of MAE alumni and recognising the importance of field epidemiology training can contribute to national and international response capacity. Who can be part of ARM? Anyone with relevant skills for infectious diseases response can be part of ARM. We review your CV, and if you are appropriately skilled, you will be invited to join the network. Calls for response from WHO GOARN and other NGOs will be posted on the network. The ARM directors coordinate the process of vetting CVs, arranging suitable training and deploying people. If you are interested in being part of the ARM network please click on the link below to submit your CV and expression of interest.